Without a doubt, we have the most interesting group of CrossFit coaches in the Napa Valley ... maybe the world! Not just skilled athletes, these fabulous folks are filled to the brim with passion for life! We’ve got a former monk, an Air Force Captain, a semi-pro soccer player, a few world-travelers, a World Champion rafter, and more. These trainers don’t just know CrossFit, they know what it means to live a happy, well-rounded life. Chat them up about their amazing experiences and add some intellectual exercise to your WOD! Beth Rypins has been CrossFitting for an almost-unheard-of 12 years. Her specialty is keeping athletes moving no matter what injury or limitation they walk through the doors with. "I will find a way to increase your mobility and build your strength and stamina," she says. Beth played the piano and read a lot as a kid, but as a teenager she found the outdoors: running and whitewater kayaking. She soon became a rafting guide. "Fast forward 25 years later, I led rafting and kayaking expeditions across the globe on remote and difficult rivers in steep river canyons. I captained the US Women's Whitewater Team to five Nationals and two World Championship titles," she says. "I was a badass! I paved the way for women in whitewater sports by accomplishing first descents on remote and difficult rivers in 27 countries on 6 continents." When she was just 8 years old, Beth was paralyzed by a stroke. "You can see by the accomplishments listed above that I recovered from the stroke," she says. "But I remember it every day! That memory gets me moving, and it inspires the work I do with everyone who walks through our doors." And as if that wasn’t already a jaw-dropping list of accomplishments, Beth also speaks Italian and Spanish. Richy Perez has been CrossFitting for five years and specializes in Olympic lifting. The thing he loves most about coaching is working with all types of people and helping them reach their fitness goals. Richy played soccer for most of his life and even went semi-pro when he was 17. "I was always a well-rounded athlete," he says. "I’ve always enjoyed playing sports and pushing my body to its limit." His favorite quote is "A champion is someone who gets up when he can't." Hilary Wendel has been CrossFitting for six years and says she specializes in motivating people of all ages and fitness levels. She loves getting to know her members, cheering them on in their victories and supporting them through challenges. Hilary has tried a variety of fitness trends and fads over the years, just part of her "living a life of inquiry." When she’s not in the gym, you can find her enjoying her other passions: musical theatre, her family, the exciting vibe of big cities, and seeking out good food. She also manages a school and community center in Bangladesh that was founded by her parents. "I love to bring adventurers to Bangladesh for trips to visit the school, so please hit me up!" she says. JC Carter has six years of CrossFit experience under her belt and specializes in Functional Muscle Rehabilitation, Structural Integration, Russian Sports Massage, and IASTM. She’s driven to help athletes recognize dysfunction and rebalance their bodies for better movement free of pain. JC became a coach because she loved her own experience as a CrossFitter and wanted to be a part of helping others learn about and love CrossFit as much as she does. 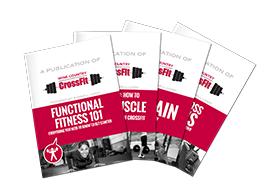 "My background in bodywork and movement assessment gave me some unique tools to be able to improve gym members’ understanding of their body mechanics and get better at CrossFit workouts," she says. "I work hard so my dog can have a better life," she says. "I believe in kindness and helping people and always using integrity as a daily tool to choose what is right." Scott Holliday has been CrossFitting for 10 years. He says he specializes in "yelling at people, random facts, and avoiding responsibility." He’s passionate about "puppies, sunrises, cupcakes and Pantera." "We are a community of athletes of all levels and we make each other better," he says. "I love the chaos of loud music and weights hitting the floor. I love to see people push themselves and do more than they thought they could. My favorite athlete is the one who has heard "you can't" all their life, and they come into the gym and lift heavy things, sweat, flop on the floor and give a big ol' middle finger to the people who say they can't. They will get a high five from me every time." Scott was teaching Defensive Tactics at the police department when WCCF opened. "I was sending co-workers there to get in shape and those SOBs started getting stronger than me," he says. "I finally walked through the doors in 2010 and totally got what I was missing ... the community of CrossFit." Nick is an enthusiastic and motivated trainer that is ready to get you fit. He recently relocated from years of coaching both in Sparks, Nevada and South Lake Tahoe, California. He is very excited to be apart of the Wine Country CrossFit family. Nick has his CrossFit Level 1 and is excited about learning more so our members can grow. He played many sports throughout his life and completed many training programs that all shape his work as a coach. Besides a passion for fitness, Nick enjoys camping and being on the water. Nick is ready to turn your training up a notch and get you into the best shape of your life! Alyx has been a CrossFitter for nine years. She started with us in the 'back yard' days and is now the consummate professional. In the interim she has served in the US Army and completed a tour of duty in Iraq. She brings a world of athletic experience to her coaching. A Napa native, she's the mother of two and is excited to be a part of the WCCF team.